Add all pesto ingredients in a food processor, except for olive oil. Blend and gradually pour in olive oil. Season with about ¼ tsp. sea salt and ¼ tsp. fresh ground pepper. Done. Soak the wooden skewers in water for at least 2 hours. This will help prevent them from going up in flames when they hit the grill. Toss the shrimp in about half of the cilantro pesto sauce and put aside the other half for later. I prefer to marinate the shrimp in the pesto sauce first for at least 2 hours in the fridge, but you do not have to. Once marinated, skewer 3 shrimp on each skewer. You can of course use larger metal skewers if you prefer. The skewers are really only for cooking purposes so you don’t end up loosing some shrimp on the grill. On a preheated hot grill, sear each skewer for 2 minutes each side until shrimp turn opaque and are firm to the touch. 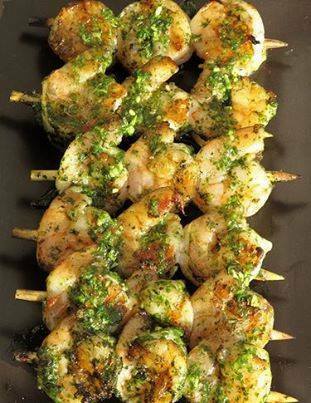 Remove shrimp from grill and serve on (or off) skewer with drizzled pesto on top. Perfectly paired with chicken or fish and field greens salad. Related article: Eat Protein. Lose Weight.